Pisces Healthcare Medical ID Dog Tag (12 lines engraved). 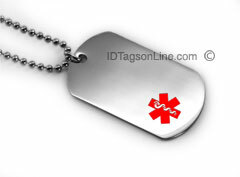 Medical ID Dog Tag. Free engraving and shipping. Pisces Healthcare Medical ID Dog Tag, IDNS36 (1 1/8"x2"), is made from .050" thick premium Non-Allergic Stainless Steel. It is guaranteed to be rust free for the life. Red enameled medical logo is embossed on the front of the tag.